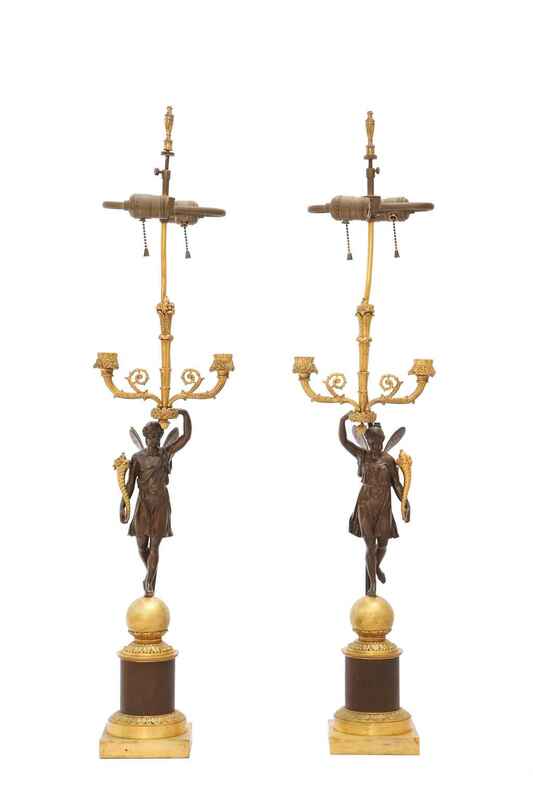 Opposing pair of electrified figural candelabras in gilt and patinated bronze, each feature a winged, patinated bronze nymph, standing upon a sphere, holding a cornucopia and bouquet, surmounted by double candle branches, raised on foliate decorated, round, reeded plinth, and square base. Opposing pair of electrified figural candelabras in gilt and patinated bronze, each feature a winged, patinated bronze nymph, standing upon a sphere, holding a cornucopia and bouquet, surmounted by double candle branches, raised on foliate decorated, round, reeded plinth, and square base. CONDITION: Very good antique condition. Wear consistent with age and use.